The Elma Patch is a simple, topical patch that efficiently and effectively transdermally anesthetizes a circular area of skin 1 inch (~25mm) in diameter. INFO Please consult applicable local law before purchasing and/or utilizing this product. WARNING This kit contains dangerous things. Use of this kit and/or any part of its contents is strictly at your own risk. Lidocaine and prilocaine can be lethal if used improperly. Dangerous Things highly recommends that purchasers of the Emla product obtain the services of a trained professional who is medically qualified and legally permitted to administer lidocaine and prilocaine topical patches. The Emla Patch is a simple, topical patch that efficiently and effectively transdermally anesthetizes a circular area of skin 1 inch (~25mm) in diameter. 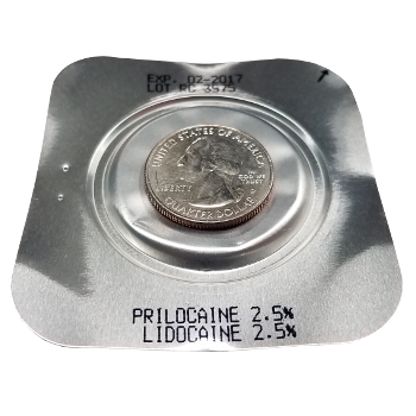 Each patch contains 2.5% lidocaine and 2.5% prilocaine combined in the same product. 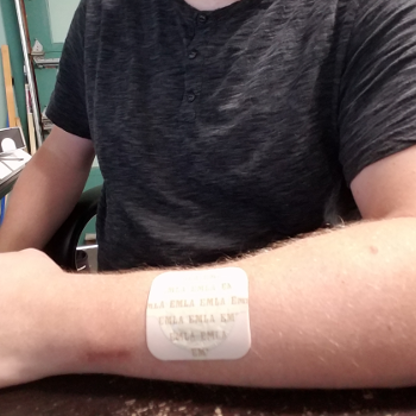 Biohackers have been known to use Emla Patches to produce a localized pain blocking effect to allow simple subdermal procedures to be painlessly performed. Unlike our Pain Management Kit, topical anesthetics like Emla Patch have far less stringent legal restrictions for numerous geographies. It is still your responsibility to check with local authorities to ensure your purchase and use of our Emla Patch product is permitted in your local jurisdiction. Research of various online medical drug databases resulted in the suggested maximum safe exposure to lidocaine be calculated at 4.5 mg/kg (2 mg/lb). Lidocaine toxicity often presents as nervous system side effects. Metallic taste, numb lips, yawning, restlessness, excitement, agitation, dizziness, blurred vision, muscle twitching, confusion, tinnitus, drowsiness, vertigo, paresthesias, and even seizures, cardiac and respiratory arrest have been reported. Rare cases of seizures following topical or subcutaneous administration of lidocaine have been reported. If you feel you have been exposed to an unsafe amount of lidocaine, or exhibit any of the above-mentioned symptoms, please contact your local emergency services immediately. The Dangerous Things PMK contains Xylocaine 2% USP. Xylocaine is the AstraZeneca brand name for the drug lidocaine, which is definitely a dangerous thing. The Emla patch may not be registered and/or approved for sale in all countries or regions. Indications of use may also vary by country and region. Product images are for reference only. Please contact your government representatives for product restrictions and legal information. The Emla Patch contains 2.5% Lidocaine and 2.5% Prilocaine combined in the same product. For US citizens, neither lidocaine or prilocaine are currently listed on any of the DEA’s schedules for controlled substances, and is legal to possess and sell at the federal level. However, there are several laws at various other levels of government regarding the use and administration of lidocaine or prilocaine. Please consult applicable law before purchasing and / or utilizing this product. For more information, please read our FAQ post on the subject.